Composting is the process of recycling natural materials by decomposition. This is an imperative process for several reasons. One is that it enriches soil for growing food by adding essential nutrients that might otherwise be absent from the soil. Another is that there is no place for waste in the closed system of our city, and is an important part of Toronto’s need for sustainability and zero waste. The most efficient way to produce compost is in a bin or container to keep the material from spilling out, while piling vertically to an ideal height of 4 feet. To have dry and green vegetation available uncombined, use large outdoor containers to store accumulating dry vegetation, while green vegetation can be collected from kitchens or stored outdoors until needed. As each layer is added, water it thoroughly so the pile is evenly moist — like a wrung-out damp sponge that does not give excess water when squeezed. Water the surface of the compost pile whenever the farm garden is watered. On rainy days it may be necessary to cover the compost pile to prevent drowning the microbes that decompose the vegetation. The compost pile should be turned once a week to aerate it, which speeds decomposition, combats odour, and mixes the material so that it will decay at a uniform rate. Compost is ready when material has turned brown and crumbly and gives off no heat or odour. Compost piles can be a pit in the ground or a pile above the ground. 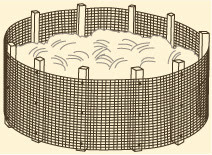 Above ground is preferable, and no special structures are needed although a large wire mesh pen will help keep the pile from spilling over and can help deter rodents (see graphic below). Using wooden stakes driven into the ground at regular intervals, nail or staple a wire mesh all the way around, preferably finding a weave that is too small for rats to crawl through. The location of the pile is best under trees, especially oaks, otherwise other deciduous trees work well. In the absence of trees, select areas that are shady and protected from wind, as sun and wind dry out the moist piles.